It all makes sense now. Doom 2's nefarious UAC wasn't experimenting on secret portal technology within its shadowy Martian facility. As creator Mr. Fiat's Byngu multiplayer mod reveals, the morally bankrupt corporation was attempting to create the unholy combination of cars, fireball spam, and gladiator-style arena fights. Those monsters. Doom 2's multiplayer keeps things squarely old-school with frantic deathmatch play and hot lead flying everywhere, so I suppose it's only natural someone made the connection between the FPS' breakneck speed and a bunch of cars zooming around like some twisted rush hour. 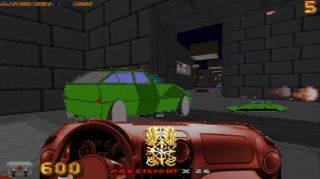 The mod includes a few custom maps tailored for car-on-car conflict, and you choose between four classes to putter around and stick a plasma bolt up an enemy's tailpipe—though, as the above gameplay video by TheDarkstar64 shows, classes mostly boil down to holding down the sprint and fire keys. Drive over here to nab Byngu for yourself. Thanks, Kotaku .